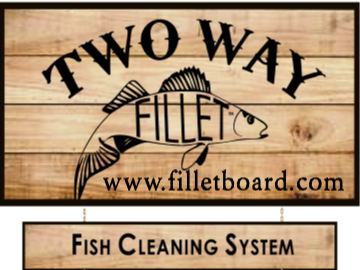 TWO WAY Fillet® – Fish Cleaning System – The most consistently effective way to harvest more meat more often when cleaning fish. Easier, Safer, Better – Our unique fillet clamp anchors your slimy fish through the entire fillet process in perfect fillet position! Our reversible clamp replaces your hand – keeping it away from fish’s head, mouth, gill plate and your sharp knife blade. No more slipping either! Using TWO WAY Fillet® is like filleting with a third hand. Fillet A Better Way®. TWO WAY Fillet® is simply the most effective way to consistently harvest more meat more often when cleaning fish. This fillet tool features a clamp that differs from all other boards out there, because our clamp holds the mouth (not the tail) which anchors your fish in perfect fillet position from start to finish. This means you have a free hand for your fillet process - like having a third hand! Anglers can easily and efficiently fillet the second side, because our clamp unsnaps quickly using one hand to turn the fish over. When all done, the angler unsnaps the clamp with the fish attached for remains disposal. Users clean multiple species of fish with TWO WAY Fillet® including walleye, crappie, pike, catfish, bass, perch, bream, trout and more. Anglers use TWO WAY Fillet® to clean fish up to 30 inches. Fishermen and women, in addition clean fish that have thinner skin such as trout or catfish by simply proceeding more slowly. TWO WAY Fillet® is easy to clean and easy on knife edges because it is made from FDA medical grade plastic. Our clamp is able to fit on either end of our because we have placed a receiving hole on both ends. As a result it is easy to switch from right hand to left hand filleting. TWO WAY Fillet® is used on your boat, at cleaning stations, at home, while ice fishing or kayaking becuause it is easily portable. 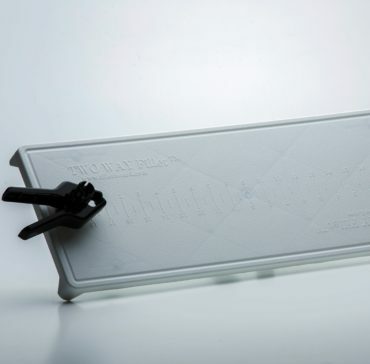 TWO WAY Fillet® resists slipping because Five rubber feet are securely mounted on the bottom of the board. Anglers hand/knuckles have room to glide along side of our board because these rubber feet raise the surface one inch above the surface on which you are working. This also gives the angler the ability to keep the knife blade in the right position for filleting. This means TWO WAY Fillet® works great whether using a fixed blade or electric knife. This also means TWF works great no matter which fillet method you use because the fish head is anchored and the board is raised up one inch. • TWO WAY Fillet® clamp holds fish by lower lip, not tail. By far, the best fillet board I have seen. Well worth the money! Went to the lake yesterday and brought back 20 bass to fillet on your fillet board. On the way I showed the board to my son and asked him to test the board while I watched. My son started telling me he had used such boards and never had much luck with them. Some of his dislikes were that they slide all over the place and the more slime produced by the fish, the more the board moves. Then he said the way he does it is much better – lots of negatives from him. For sure not an opened minded tester… negative from the beginning. The fish ranged in size from 1-3 pounds.